The family style roast chicken at Trotwood. Photo by Noni Bruckner. Sometimes you just want a romantic getaway or a cozy, relaxing weekend upstate with friends without the adventuring. When lying around in comfy sheets, reading, playing board games, and never leaving the hotel is order of the day, we’ve got you covered. Boutique hotels with farm-to-table restaurants nested within them have popped up all over the Hudson Valley in the past few years—but they are not all created equal. We scoured the region for the hotels and inns with the best food programs so you never have to leave the premises. Under new owners, the legendary Round Top resort Glen Falls House offers a saturated sensory experience, epitomized in its restaurant Trotwood. Though she has no formal training, head chef Chrissy Michaels was raised by chefs, and she grew up cooking classic Italian dishes. She spent 13 years in New York City restaurant industry, earning her stripes at places like Saraghina and Pizza Moto before moving Upstate. Her self-described cooking style is “farm-to-table American comfort food,” though the classic Mediterranean flavors of her childhood sneak in. In Greene County alone, she sources directly from Lime Kiln Farm in West Coxsackie, Bulich Creekside Farm in Leeds, and Stoneledge in South Cairo. 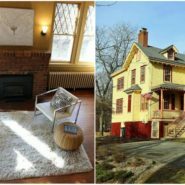 Read our profile on Glen Falls House. DMI began as the summer estate of the Colgate family. Legend has it that later, it was owned by Jack “Legs” Diamond, the famous bootlegging gangster who’s said to have taken a particular interest in Catskills real estate. Now, on 160-some wooded acres laced with trails, the cedar-shingled main house is a rustic-chic six-room inn with a swingin’ restaurant run by Michelin-starred chef Ryan Tate. His culinary philosophy involves making the most of the ingredients around him, whether that be tapping the property’s maple trees for syrup or fishing trout out of the stocked pond, or harvesting herbs and veggies from the kitchen garden. Read our profile on DMI. Rabbit loin and offal. Photo by Emma Mead. The Stewart House, a recently renovated, luxurious 9-room inn on the waterfront in Athens, has a gorgeous Art Deco bar and restaurant on the ground floor, plus a riverside outdoor grill in summer. Open Thursdays through Sundays, the Ca. 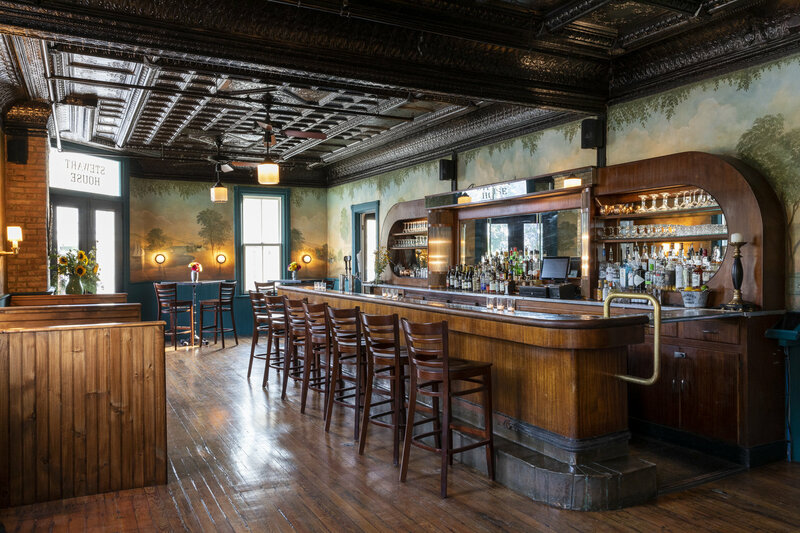 1883 Tavern has a cocktail hour from 3-5pm with $2 oysters and a bar menu. Dinner service starts at 5pm, and the mains range from a one-flip double cheeseburger made with grilled onion, aged cheddar, and special sauce on a brioche ($16) to a whole roasted Catskill trout with roasted hakurei turnips, charred brassica mayo, and baby watercress ($32). Read our profile on The Stewart House. The Art Deco bar at the Stewart House Inn. After taking over Audrey’s Farmhouse in 2015, Sally and Doug Posey bought the lot across the street, a former flower nursery, which they have transformed into The Greenhouses—a 14-room hotel, jungle-chic wedding venue, and farm-to-table restaurant. The whole property is dog-friendly, some of the rooms even have fenced yards for your furry friend. The onsite restaurant is open to hotel guests and the public Thursday through Sunday. The Greenhouses Kitchen, built on the site of a former cement block warehouse, serves up a rotating mention of farm-fresh seasonal fare. On a warm July night, options included a red grape tartine appetizer, with grapes, goat cheese, and pork cracklings ($7.29); a steak frites main served with garlic scapes ($24.95); pulled pork with red cabbage salad and polenta ($15.50); and the fixture—the $9 Burger. Read our profile on Audrey’s Farmhouse & The Greenhouses. 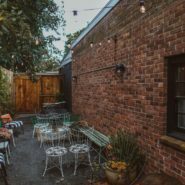 The most exotic hotel restaurant to join the upstate scene is The Corner, which is on the ground floor of the Hotel Tivoli, a 10-room boutique accommodation owned by artists Brice and Helen Marden. Decked out with Berber rugs, Murano chandeliers, MCM furniture, and high-end art the Hotel Tivloi is a chic yet unpretentious place to stay. 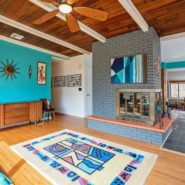 Walking into The Corner, you get the feel of a neighborhood place where the neighbors are college professors, well-heeled students, second-home owners, and young artists. On the right is the bar room, with its stunning chandelier and expanse of marble. Chef Devon Gilroy, a veteran of top NYC restaurants including A Voce and Chanterelle, has focused the frequently changing menu on Moroccan-inspired Mediterranean cuisine executed with local ingredients. 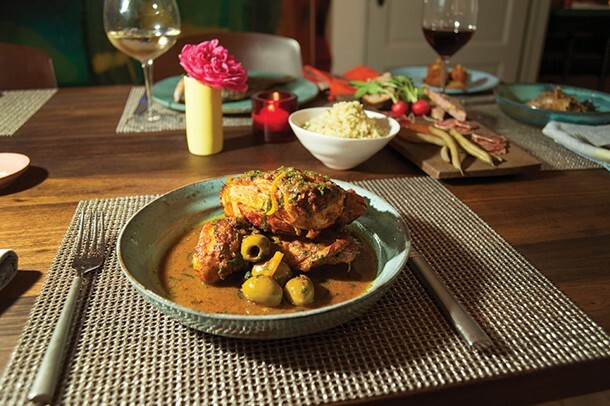 The signature dish is the Moroccan Chicken. Also worth a mention is the cocktail program was designed by Employees Only, a neo-speakesasy in the West Village run by the chef’s father, famed restaurateur Billy Gilroy. Read our profile on The Corner. The Corner’s signature dish, Moroccan chicken. Photo by Roy Gumpel. Troutbeck is a historic Tudor-style mansion-turned-inn on 45 manicured acres in eastern Dutchess County. Laced with gardens, secret pathways, stone bridges over the Durham Creek, and quaint outbuildings, the lush estate has a magical quality. Lodging is split between the main manor house and several detached buildings, with accommodations for up to 72 guests. 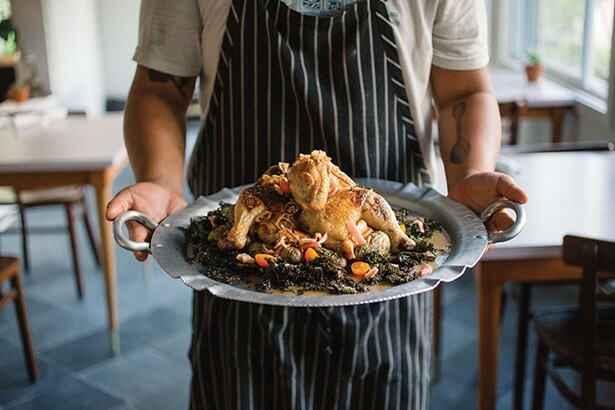 The inn’s farm-to-table restaurant is run by decorated chef Marcel Agnez. Inspired by his mother’s recipes and upbringing in Normandy, France, Chef Marcel works to create carefully curated menus that change seasonally and features locally sourced produce from the Hudson Valley and Connecticut. The restaurant is open to the public, you can reserve a table online. 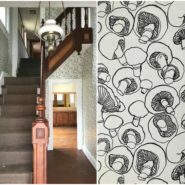 Food is foundational at The DeBruce, a renovated boarding house perched on over 100 acres of land in the Catskills. Executive Chef Aksel Theilkuhl’s culinary approach is deeply steeped in the foodstuffs produced by the farms and forests surrounding the inn and the historic cuisine of the region. 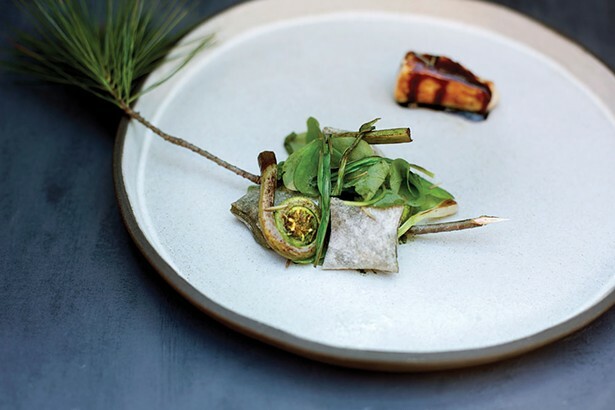 Foraging mushrooms and wild edibles, and buying directly from neighboring farms allows Theilkuhl to craft authentic menus that honor the seasonal calendar. Breakfast and dinner are included with all room bookings. Try the tasting menu for $125 per person. The public is welcome with a reservation. The DeBruce’s 28-seat dining room with bluestone floors and walls of windows that open in the summer. Buttermilk Falls Inn and Spa, a 75-acre estate, offers a combination of historic elegance, modern luxury, country charm, and sophisticated amenities. Passing through the stone gates of the estate, you are transported to a bucolic, self-contained retreat on the banks of the Hudson River. Recharge in one of the charmingly historic bedrooms or guest houses, enjoy a spa treatment utilizing home-grown fresh herbs, or take a stroll of discovery on a network of trails leading to ponds, the property’s impressive namesake waterfall, wildflower fields, and lush gardens sprouting dramatic sculptures. 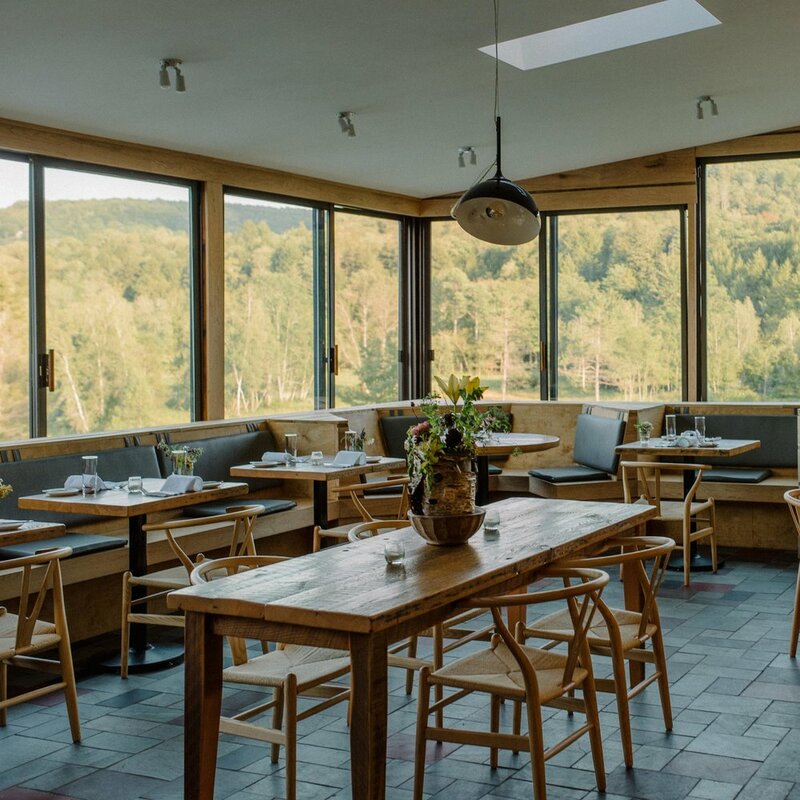 You can also savor a memorable dining experience at Henry’s at the Farm Restaurant, which sources its meat and produce from its own Millstone Farm and other local producers practicing sustainable agriculture. And finally, in Hudson, Rivertown Lodge’s relaxed, simple presence brings vacation vibes to Warren Street. Though the black-and-white front of the building has an understated Hollywood marquee vibe to it, inside Rivertown’s 27 spacious suites have a cozy feel. Flooded with light from the factory windows, the rooms’ shelves are lined with books, records, vintage radios, and textiles that make you feel right at home. The in-house Tavern kitchen is open Friday through Tuesday, 5-10pm, and blends Hudson Valley ingredients in a seasonally rotating menu that sometimes borrows flavors from North Africa and Morocco. Owner and former chef of Bonfiglio & Bread, Gabriele Gulielmetti, uses his expertise to create a flavorful breakfast menu. 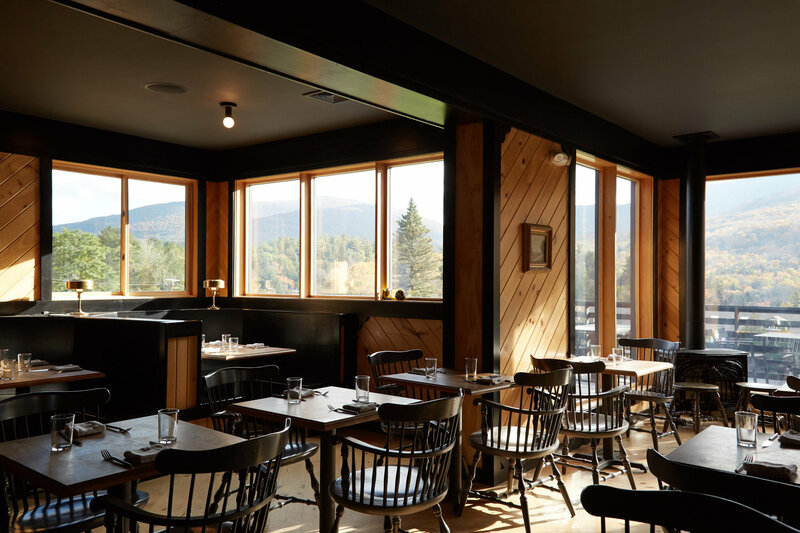 Make your way to the town of Hunter and you’ll find Scribner’s Catskill Lodge at the foot of the mountain. During a major remodel in 2016, the resort’s 38 rooms, full-service restaurant, pool, and common spaces were redesigned with dark maple floors, vintage rugs, fireplaces, and custom furniture. Prospect, the on-site restaurant, serves up quintessential American dining with a twist, with an ever-changing menu and cuisine that incorporates locally-sourced products and vegetables grown on the premises. Between meals, guests can sip cocktails and local beers and ciders either inside the dining room, featuring floor to ceiling windows, or out on the surrounding deck. Read our profile of Scribner’s. The Propect dining room at Scribner’s.